Here are some WIPs I'm hoping to make progress on during CCX. First off are a couple of early 2000's figures that are assembled and ready to be painted. 2004 Storm Shadow (v12) from the Cobra Strike Team - Urban Division. I have already made Scrap Iron and Firefly from this set. Next up, I have had Daina on my to-do list for a while. I have been meaning to update my entire Oktober Guard that I made in 2008ish. I figured Daina was a good place to start. I still love the figures that I made for it last year, but part of me wants some vintage inspired figures as well. I started putting together a Safari Guide and a Safari Mom. I want to change the Guide's legs to remove the knee pad and the Mom needs some sanding to make everything fit. Last edited by OreoBuilder on Mon Feb 15, 2016 6:00 pm, edited 1 time in total. Dang it OB, you're gonna force me to start making Adventure People customs now. Check out my Facebook Customs/Dios Page and my Customs on Figure Realm. And while you're at it - buy my crap on eBay! Second, I started looking at parts for the pilots. I want to keep the vintage feel, so right now I'm leaning toward using the Viper torso and Ripcord legs. Also, I threw together a labels sheet. I'll have to resize these, but at least they are all in one place. love to see the process behind your art! I will use the Safari Mom build to make the Safari Girl instead. I already have a few all yellow females in my customs collection, so I'm looking for something different. I did some cutting and sanding to get the parts to fit. Also, I got the base coat (beige) done on the Adventure People Safari Guide. Finally, used Krylon white spray primer to start on Big Ben. Interesting. The Krylon white doesn't stay tacky on the softer plastic? The white acrylic primer actually dries really well even on the softer plastic. It dries flat (no sheen at all), porous and quickly. I avoid the Krylon Dual (primer + white finish) for figures, that stuff stays tacky. It can work for vehicles though. This is what I like about this board. Everyone pulls ideas from all sorts of lines and gets them to work in the GIJOE universe. Huh. So Krylon White Primer. I might have to give that a shot. I'd given up on priming but your results are hard to argue with. I always do my base coat by hand and have never tried sprays based on warnings about tacky paint. After seeing this I may try it too. This would save me heaps of time. I can't wait to cut those babies up for parts. I made some progress on my Adventure People Safari. Jody's face and hair still need work. I need to paint the yellow and tighten up the flesh tone. 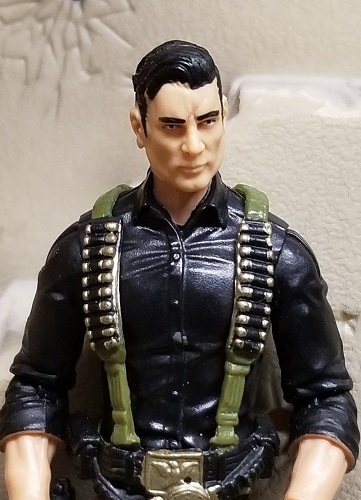 For Jim, I still need to paint the belt. I figure I have 2 choices - the same dark brown as the shoes or the lighter brown of the hat. Thoughts? Also worked on the Rescue Copter and the pilots. I managed to spray the black parts of the chopper. For the pilots, I settled on the Viper torso, Shipwreck/Spirit arms and Ripcord legs. I like their more simple/retro feel as opposed to the more modern parts. I sprayed a white coat of primer on the bodies. I'll start the yellow tomorrow. I'm planning to swap out the pilot's head with a Wayans one. Big Ben: I painted the off white on his uniform and started the light brown. do you spray primer on assembled figures? I had thought that torso's would have to be cracked and complete disassembled for spray. everything is shaping up really nice! Yup, I spray assembled figures, but I prep them first. I remove forearms by heating them with a hair dryer for a few seconds. I trim some plastic from the shoulders, elbows and other joints to reduce paint rubbing and I reassemble everything. I glued some figure stands on the end of plastic rods. I stand the figure on the the stand part and spray.